The topic of well-being in the workplace is getting a lot of attention right now. The January/February issue of The Harvard Business Review featured articles on “The Value of Happiness – How Employee Well-being Drives Profits.” Since people spend more time at work than in any other single environment, it behooves leaders to create organizations that foster the well-being of its members. Yet few organizations see personal well-being as an important focus for their business, nor do they understand the powerful connections between personal well-being and organizational success. Study after study has shown that when individual employees experience well-being, they consistently apply their skills and hearts in service of company goals and customers, adapt more flexibly to change, and are more creative and proactive problem solvers. The foundation of any healthy, positive work environment is a culture of trust. When trust is present, people are willing to take risks, go the extra mile, and offer the best they have to give. The sense of safety and security that comes with a high-trust culture allows people to focus on the goals at hand rather than spending time questioning decisions or doing just the minimum amount of work to collect their paycheck. Well-being in the workplace begins with trust, and Lisa Zigarmi and Chris Edmonds provide leaders with actionable steps to create a healthy, affirmative work environment where every individual contributes, connects, succeeds, and thrives. 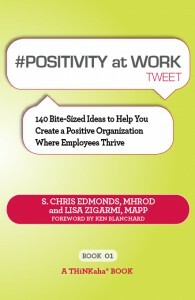 February 27, 2012 in Business Books, Corporate Culture, Employee Engagement, Human Resource Issues, Leadership, Relationships, Trust, Wellbeing. intellectual, spiritual, financial, environmental, social, and occupational. Thanks for your comments Rohno. I agree with you about the importance of those additional components you’ve suggested and I see them as a foundation that runs through several of the pillars, particularly the Meaning and Purpose one.